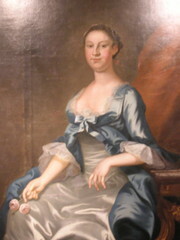 Kenmore was the home of Colonel Fielding Lewis and Betty Washington Lewis, George Washington’s sister. Lewis bought the land for his plantation in 1752. It is unclear when the mansion was built. Some sources claim it was built soon after Lewis acquired the land, while others claim it was not until 1775. Though simple on the outside, Kenmore’s interior makes it famous. The plasterworks on the ceilings and above many of the fireplaces are outstanding pieces of artistry. 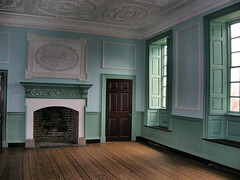 George Washington himself suggested the design for the stucco over the mantel in the drawing room (Fleming 6). Along with the mansion, the plantation included crop fields, a warehouse (that still stands on 1200 Caroline St. as the headquarters for the Historic Fredericksburg Foundation), and a shipyard on the Rappahannock. His Kenmore plantation encompassed 1, 300 acres and stretched all the way to the Rappahannock River (George). Lewis was a prominent citizen of the area. As a planter, he grew tobacco, wheat and corn. He was also a merchant and shipped goods back and forth from England (George). His civic duties included churchwarden for St. George’s Episcopal Church (Duke 38), member of the Fredericksburg Masonic Lodge No. 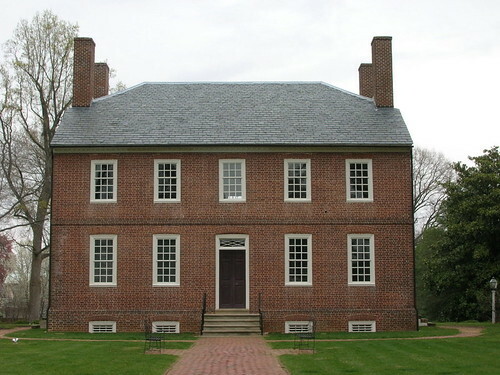 4 (40), and Spotsylvania representative at the House of Burgesses in Williamsburg (62). During the Revolutionary War, Lewis contributed greatly to the war effort, particularly in his management of a gun manufactory that supplied the Virginia regiments with arms. He gave much of his fortune for the success of the Revolution; he was nearly bankrupt at the time of his death (Goolrick 23-24). Fielding Lewis died in December 1781, soon after Cornwallis surrendered to General George Washington at Yorktown. Sixteen years later, in 1797, Betty Washington Lewis died and the plantation was sold. Soon after Betty Washington Lewis died, her stepson, John Lewis, and his wife sold the plantation to Seth Barton of Baltimore. Upon his death in 1815, the plantation was sold to John T. Thornton, a prominent Fredericksburg citizen. The next owner of Lewis’s plantation was Samuel Gordon, who named it Kenmore in 1819, after his ancestral home in Scotland. The Gordon family owned the mansion until the Civil War, during which Kenmore was used as a hospital by Confederate forces. After the war, it operated as a boy’s school. In 1881, William Howard purchased Kenmore and restored the mansion to its former glory. He paid particular attention to the plasterwork, which had been damaged by age and the Civil War (George). In January 1921, Kenmore was slated to be turned into apartments or leveled. Women in Fredericksburg were outraged and soon formed the Washington-Lewis Chapter to save Kenmore. Over the course of thirty-two months, the group, now renamed the Kenmore Association, raised thirty thousand dollars and saved Kenmore from demolition on January 1, 1925. 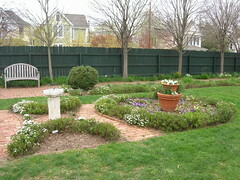 The Garden Club of Virginia, established in 1920, restored Kenmore’s gardens as one its first restoration projects in 1929 (Duke 188-195). In 1999, the Kenmore Association became the George Washington’s Fredericksburg Foundation soon after it saved George Washington’s childhood home, Ferry Farm. The George Washington’s Fredericksburg Foundation still owns Kenmore and is close to completing a multi-year long restoration of the mansion (George). “Kenmore,” Courtesy of Amy Benjamin, 2008. “Betty Washington Lewis,” Courtesy of Amy Benjamin, 2008. “Inside Kenmore,” Courtesy of Amy Benjamin, 2008. “Kenmore Gardens,” Courtesy of Amy Benjamin, 2008. Darter, Oscar H. Colonial Fredericksburg and Neighborhood in Perspective. New York: Twayne Publishers, 1957. Duke, Jane Taylor. Kenmore and the Lewises. Garden City, NY: Doubleday and Company, Inc., 1949. Felder, Paula S. Fielding Lewis and the Washington Family: A Chronicle of 18th Century Fredericksburg. Fredericksburg, VA: The American History Company, 1998. Fleming, Emily White. The Kenmore Mansion: Built in 1752, Home of Colonel Fielding Lewis and His Wife, Betty Washington. Fredericksburg, VA: The Kenmore Association, 1924. George Washington’s Fredericksburg Foundation. http://www.kenmore.org (accessed April 11, 2008). Goolrick, John T. Historic Fredericksburg: The Story of an Old Town. Richmond, VA: Whittet & Shepperson, 1922.